LASEK vision correction is an improved version of PRK (photorefractive keratectomy). PRK had rather prolonged and painful recovery period. Moreover PRK could not be performed on both eye together. These and other negative aspects made researcher look for other options and provoked new developments in Excimer-laser correction. Ophthalmologists had to achieve a goal: minimize cornea damage and make the procedure even more effective, and also affordable for those who had contraindications for both PRK and LASIK. The first LASEK treatment was performed in 1996 by Dimitry Azar (Massachusetts) but was brought to wide scale by Doctor Massimo Camellin. Unlike the previous methods (like PRK and LASIK) the use of LASEK completely avoide keratoconus development as this procedure is performed on the surface cornea layer. During LASIK all the epithelium is detached along with a quarter of stroma and for LASEK – only epithelium. As more corneal tissue is intact this procedure may be used in patients with thin cornea and LASIK cannot be used. The difference with PRK is that during PRK the epithelium is completely removed, while LASEK keeps it all. For this reason LASEK is less painful and requires shorter recovery period. In addition unlike LASIK, LASEK excludes any damage to the inner corneal layers, e.g. stroma. Anaesthetic eye drops are used (general anaesthesia or anaesthetic injections are not used). When pain management has taken effect the blepharostat is used. It is used to prevent involuntary blinking. The patient is asked to look at the bright spot in the unit to align the eye position. Using a special solution (ethyl alcohol) and tools the surface corneal layer (epithelium) is detached as a flap. This epithelium flap acts as a natural contact lens and reduces the pain syndrome and corneal opacity risk. 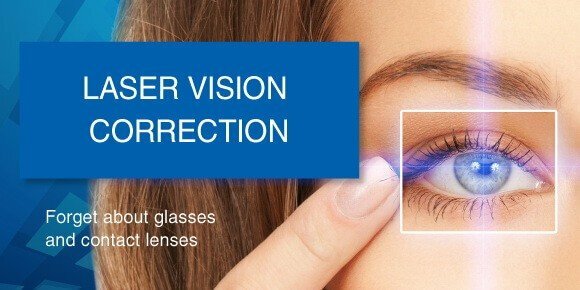 The laser correction is performed affecting the front cornea layers. After the laser correction the epithelium is replaced back to its place. A soft contact lens is attached to the eye after the treatment. This lens protects the cornea, and normally it is removed 4-5 days after the procedure. The same procedure is followed on the other eye. A special medication is used when performing LASEK procedure which prevents cornea clouding (this was the main reason for abandoning PRK on large scale). Damage to nerve terminals of the eye corneal epithelium is possible during LASEK causing pain sensations after the treatment. In view of the above disadvantages Epi-Lasik is gaining more popularity of late.